Angel Beats, featuring teens battling it out in an after-life high school developed by the Key (Clannad, Air, Kanon) folks, is now offered on subtitled, streaming on The Anime Network and on TV via with an English dub via OnDemand in June. The English dub features stars Blake Shepard, Brittney Karbowski, and Hilary Haag. A complete set of the series will be available on DVD and Blu-ray from Section23 on June 28th. 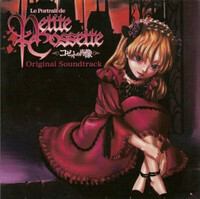 Le Portrait de Petite Cossette, Akiyuki Shinbo (Maria Holic, Bakemonogatari, Puella Magi Madoka Magica) pre-Shaft loligoth horror OVA (they were involved with the second of the three episode) was re-released by Section23, and already making The Anime Network rounds, but some eye catching promos were still YouTubed. What happens when the face you see in a reflection isn’t your own? That’s the shock that awaits Eiri Kurahashi when he sees the living image of Cossette d'Auvergne in a glass in his uncle’s antique shop. Infatuated, he becomes possessed and mysteriously makes contact with the beautiful young aristocrat, only to learn that she was murdered 250 years earlier. Now, her soul trapped inside the goblet, she can only be set free if someone is willing to pay for the sins of her murderer, the artist Marcelo… who may very well have been reincarnated as Eiri! As shadowy forces surround Eiri, his love for Cossette drives him down a tortuous path of self-destruction, while those who love him in the real world can only watch in horror!